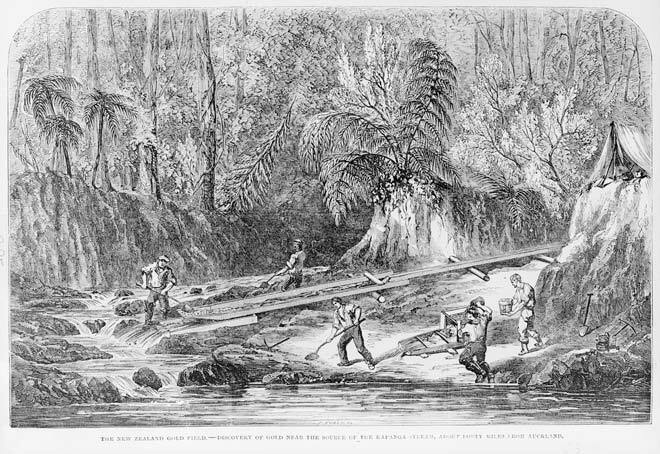 This engraving from about 1852 shows men working the first find of gold in New Zealand. The diggers in the foreground are working a cradle – one man shovels gravel into it, while the other two tip in buckets of water and rock the cradle. The sluice box in the background has a constant supply of water entering along the wooden fluming, and all the men have to do is to shovel the gold-bearing gravel into the box. In my opinion the two large objects in the right mid-view, and to the hard right hand side with the tent perched on it, are Kauri stumps. The one with the fern growing from it I guess at 60ft(?) round the base. The other is big enough to put the camp site upon. We see no large Kauri around the site, which suggests that by 1853, when Charles Heaphy drew the picture that we see (and he was a very capable artist) the largest of the kauri had been extracted from this point in the Driving Creek catchment down to the waterfont. This would put the bush line approx 3 km inland - completely clear felled.